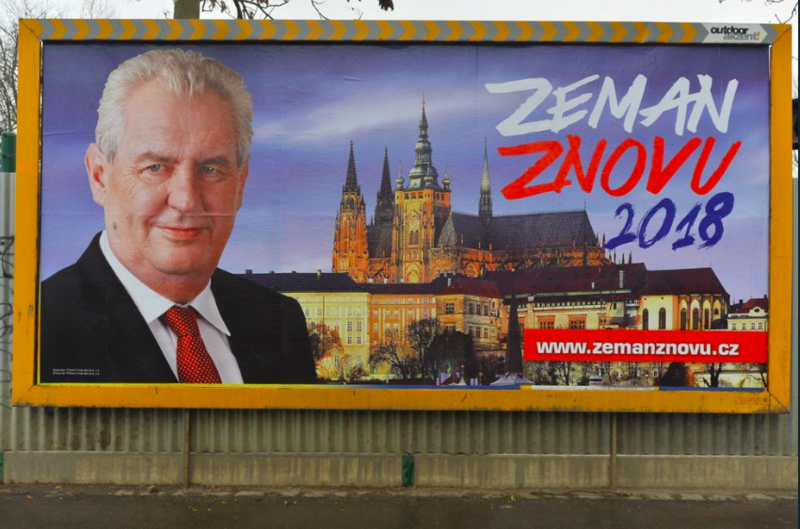 Across the country billboards for Milos Zeman’s presidential campaign and his portrait have appeared. According to the Office for the Surveillance of the Political Parties and Political Movements, Milos Zeman, despite promises, leads his campaign. The Surveillance Authority for the Surveillance of Political Parties and Political Movements is convinced that , despite this Zeman’s public commitment, the President leads the campaign. According to Jan Outlje, Zeman is abusing presidential excursions to the regions. “He is campaigning, there is no doubt, he leads a campaign to meet with citizens. We monitor these exits, we have an estimate of the cost of this campaign and we are waiting for costs, cities, municipalities or regions to appear on the Milos Zeman transparent account, as stipulated by the law, ” said Outlje. The law allows individual candidates to publish all campaign data on a public account at least three days before the election. President’s election will be about six weeks later. Therefore, the campaign enters the hot phase in the pre-election time. The billboard with the portrait of Milos Zeman and the inscription “Zeman Znovu 2018” also appeared in the republic . The inscription has the same graphic editing as the official slogan on Zeman’s candidacy web site, which he registered with the Supervisory Authority. Both the sponsor and the advertising contractor are friends of Milos Zeman on the posters. “It is precisely because the sponsor and creator of the posters is the Friends of Miloš Zeman, that this means that Milos Zeman knows about this campaign or he does not define it at all, and the graphics are the same as Miloš Zeman on the official Zeman candidate site again and on this site he is registered as the contracting authority and the contractor Milos Zeman” said Jan Outlý, adding that the law remembers two campaign options – with the knowledge and awareness of the candidate. “This indicates that this campaign is conducted with his consciousness. And then he does not really care who pays it, and he has to count the candidate for his limit, “said Outlly. “The president is not the contracting authority and the processor. This is the same situation as the life story that was sent to the mailboxes, “ spokeswoman Jiří Ovčáček commented on new billboards . It was the story of Miloš Zeman, who was printed by the Teplice businessman Jaroslav Třešňák. “It is his associations, legal and natural, who act in his favor with his consciousness. And in that case, the campaign is also attributed to him, “ says Outl. “Mr. Milos Zeman does not lead a campaign, he is not the client or the editor of the billboards, so you can not see any payment from his bill. However, Milos Zeman has previously stated that he will not prevent anyone from supporting him or her and the life story in the mailbox, which was ordered and paid by Mr. Jaroslav Třešňák. About these billboards Mr. Milos Zeman is informed and the amount will be included as a non-financial performance up to the limit of the election campaign exactly according to the relevant law “responded to our question Barbora Filípková from Zeman’s election team. The Office for the Supervision of the Financing of Parties and Movements also examines the posters that are an advertisement for a book of conversations with Miloš Zeman. Her co-author is Zeman’s spokeswoman. And just like the posters of Zeman Again 2018, the official portrait of the President is also the advertisement of this book. Associations as advertisers, according to Outlů, also report other presidential candidates – Michal Horáček or Jiří Drahoš . The law does not forbid this option. Each candidate may spend 40 million crowns before the first round of the election, in the second round, then 10 million crowns. The first round of elections will be held on January 12 and 13, 2018. Milos Zeman’s mandate ends on 7 March.